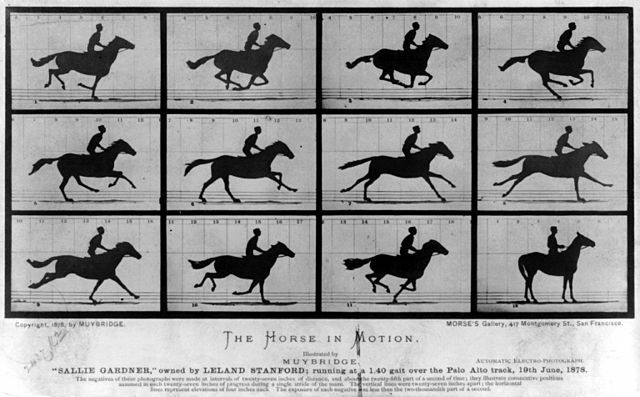 One of many studies in motion done by Muybridge, giving us insight into what our eyes might miss. most common complaint is that a photo is “just a moment in time” – yet, without the “moments in time” that Eadweard Muybridge gave us, we would not know the actual sequence of the footfalls in a horse’s stride. How can it be that those “moments” were valuable, but those we see today are not? The truth is, they are just as valuable – they just might not always be agreeable with our perception. Just as with Muybridge’s discoveries in locomotion, today’s photos capture moments that are missed by our naked eye. I have long used photos to study the principles my instructors taught me. I find them very valuable for studying equine anatomy and biomechanics used correctly, and incorrectly. Photos, especially of rides I have seen in person, help me evaluate whether the things I noticed were real, and notice subtle things I missed that I then learn to look for. In short, they help educate my eye. I could certainly understand that concern, had there actually been anything in the article that could count in any way as a criticism. In fact, the article could easily have been done without the use of famous horses. Instead, the author actually used photos of the famous to illustrate completely faulty ideas of movement. Since I have been wanting to have fun with photos for a while, this seemed the perfect place to start! This is probably the simplest gait the horse has, in terms of illustrating and understanding. The legs move in diagonal pairs, with a period of suspension in between, creating a ‘two-beat’ gait (if your definition is counting footfalls … I’ve found some who actually debate that the suspension is a beat, but that is not the typical understanding). Interesting. So horses have different “mechanics” to their trot? 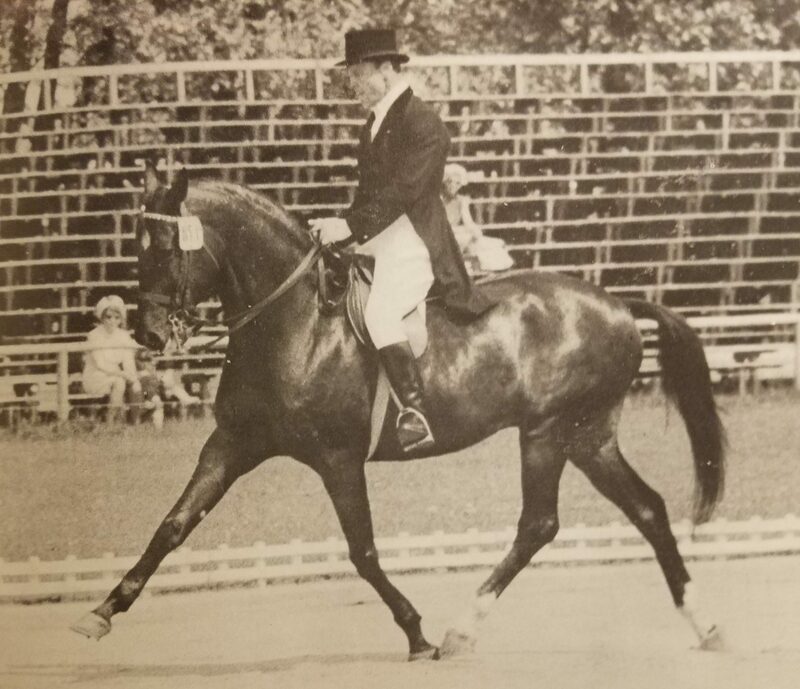 I had always heard that this constituted a different gait – amble, shuffle, rack, pace … all “exceptions” on trot “mechanics” – yet none of them are acceptable in Dressage. If you look at the Muybridge trot sequence, you will see the ‘ideal’ the author is referring to – that is, the forearm of the front leg is always parallel to the cannon of the opposite hind leg. This is a natural trot, and it is a clear indication of a clean two beats. Two top horses that apparently are “mechanically” different from other horses. the photos to the right – the hind leg significantly trails the path taken by the opposing front leg. The suspended front and hind legs will not land in one clear beat, as the front leg is much further in its arc than the opposite hind. The only mechanical issue here is that of a hollow, tight back and disengaged hind quarters. 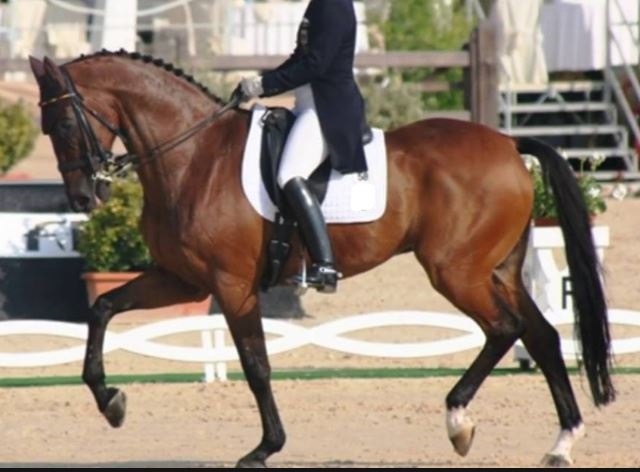 These horses are both innately talented, and show a lot of freedom in front – but what they are showing behind is counter to every ideal of Dressage. In the case of the chestnut, the left hind is actually dragging the ground. This is MUCH more than a “moment in time” issue. The lack of thrust and activity behind will result in the forelegs of these horses dropping backward before they hit the ground – there just isn’t enough support from behind to complete a full stride in the direction the toe is pointed. The result is a goose-step style extension, where little ground is actually covered. 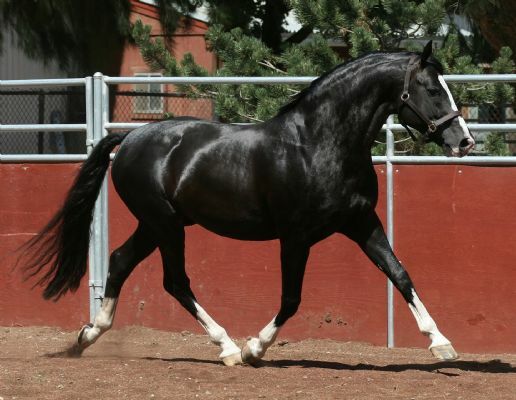 Compare the images above to this one of a horse of the same type, doing a natural extended trot. Note that he also has the parallels seen in the Muybridge photos. He has an apparent slight loss of pure two beats, as the hind leg is about to land before the partnered front leg – but compare that to the photos above, where the hind leg has barely started it’s track forward, while the front leg is at full extension. 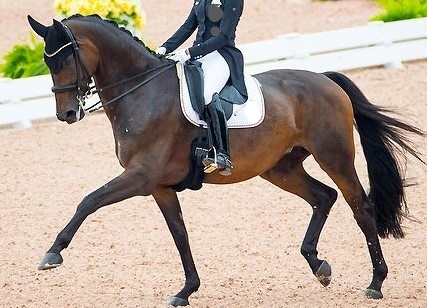 If the hindquarters are supposed to be the ‘engine’ of a Dressage horse, how can one justify that it is lagging behind the forehand in what should be the most powerful and active trots in Dressage? Even in the most extreme extension possible – that of a Standardbred racing horse – notice just how close the parallels (front leg forearm and opposing hind leg cannon) are maintained. Of course this Standardbred is moving to the fullest physical extent possible in the trot, while in Dressage we work to have our horses maintain a more contained balance. However, it shows that even with the extremely likely risk of the hind leg running into the foreleg, and the extreme reach of the opposite foreleg, equine biomechanics still tends toward maintaining that parallel. The point of a “marked lengthening of frame” seems to be in dispute with some, particularly those who skew very classical (as in pre-20th century) in their focus. Think of this definition as you view the next photos. Here are a few examples of good extensions – none ‘perfect’, and all very different types of horses, yet all showing the pairs of legs in parallel. 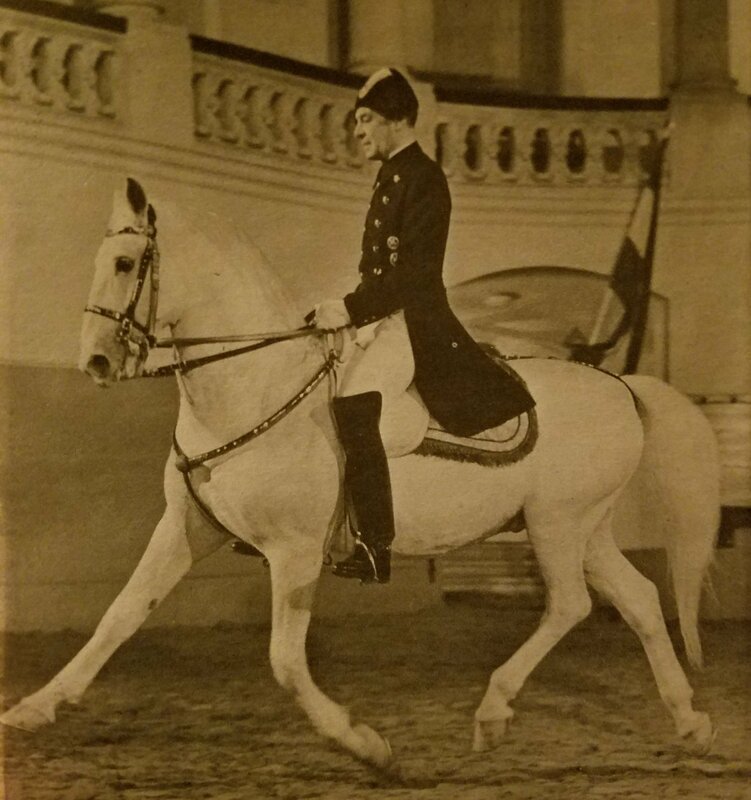 The one exception is the Lippizan, whose lifting pair are slightly off parallel – likely a combination of shoulder mobility and speed of the foreleg off the ground (the latter being a quality of collection). Just for a simple comparison (and to decrease your need to scroll too far back and forth), here is another example of the different “mechanics” that we are discussing. Aside from comparing the legs in this photo to those just above, look for other qualities that may provide clues to the cause of this biomechanical dysfunction. Pay particular attention to the neck, shoulders, and sternum. Although the haunches are the ‘engine’, the effect of correctly engaged haunches should be seen in the lifting of the sternum, shoulders, and base of the neck. Does the lower horse give the same sense of lift as the three above it? Does the weight ‘feel’ balanced between the load on the landed front leg, and the load on the landed hind leg? Does it give the same feel of covering ground with power that the three above do? I’ve used the extended trot because it is the most extreme case of what the Horse & Hound author seemed to think was different horses “mechanics”. But the lack of parallel legs is visible today in the collected trot as well. Just compare these two photos. To be completely fair, this is not just a ‘then vs. now’ or ‘old vs. new’ problem. I found a number of older photos that showed the biomechanical defect, and a few new ones that did not. However, there were far more correct examples in the older photos, and far fewer in the newer ones (and none of the top international competitors). This illustrates two things – that this dysfunction, caused by training, is a growing trend; and, that it is being rewarded by the judges, which will further instill it in the sport. There are many training methods, and I will be the first to say that different paths can lead to good result. However, when you go against the natural biomechanics of the horse, you greatly increase the risk of injury to them. 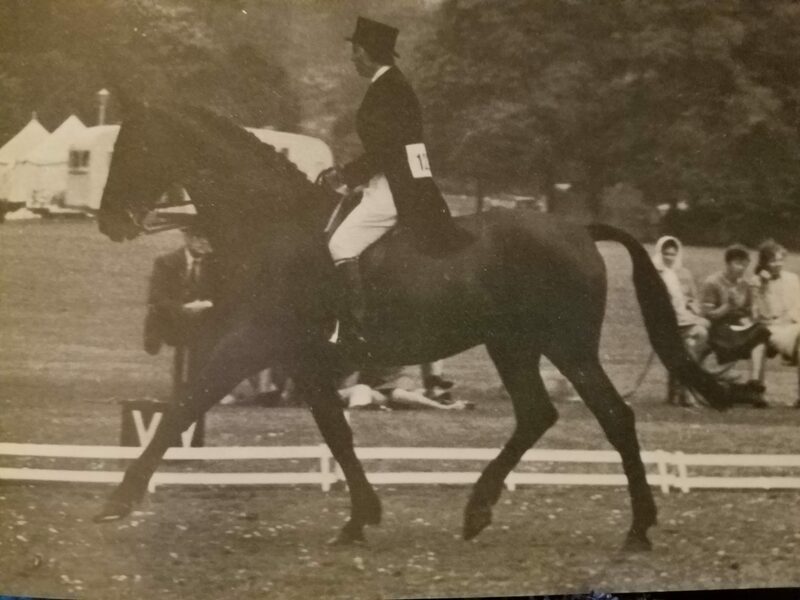 When I was showing, Dressage horses were the ones our veterinary school would remark on when they came in – so rare was injury or dysfunction to a Dressage horse. Now Dressage horses make up the majority of non-racing patients – sometimes even surpassing the racehorses in injuries seen. Veterinarians can now rattle off the maladies that afflict Dressage horses, where there was no such list before. When you have industry insiders defining dysfunctional biomechanics as just different “mechanics” specific to that horse, there seems little hope that anyone will recognize the damaging effect of interfering with the horse’s normal biomechanics. Don’t be taken in by the rhetoric. Photos may be a ‘moment in time’ – but they reflect more than just that. Look critically at the mechanics you see in a photo. Does it reflect what is natural to a horse’s movement? Is it more beautiful than the photos of horses unburdened? If not, try to figure out why. If you want to confirm whether it’s an anomaly for that horse and rider combination, find a video of them. I’ll wager that any dysfunction you see in the photo will be reflected in the movement. 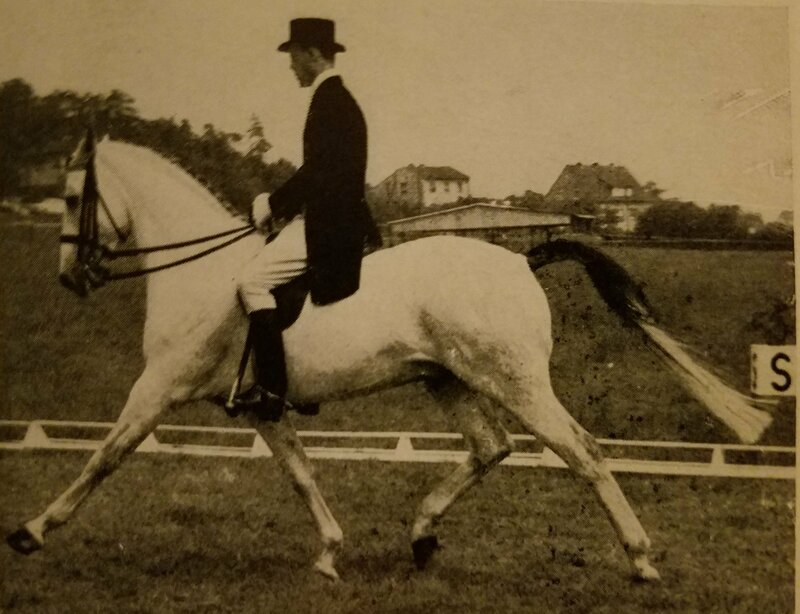 This entry was posted in Improving Your "Eye" and tagged biomechanics, Dressage, Eadweard Muybridge, engagement, extended trot, hollow back, improve your eye, photos. Bookmark the permalink. Very good and interesting points. I do think the reason the “moment in time” phrase came around, however, is because it is important to know a combination in full and not judge them off one frame. By no means is looking at one frame of a horse with a disengaged back, open mouth and behind the vertical something to strive for or defend, but if this combination had done 99% of their test beautifully but were being ripped to pieces by strangers on the internet for the 1% where things did not go to plan I hardly see the purpose or lesson to be learned from that. Reflection and critique are good, but let’s keep in mind that everyone is out there trying to do their best, and that more change can be effected through praising good practices over shaming those who aren’t perfect, or still learning. Actually, when I first started hearing the ‘moment in time’ argument it was largely in defense of some pretty bad photos of top Dressage riders … things like gaping mouths, with blue tongues and overtight curbs. At that level, there is literally no reason for those ‘moments in time’ to be happening. It is actually not too hard to identify an ‘oops’ moment in a ride from what is a systemic issue. There is never an excuse to rip anyone to pieces – but that is as old as humankind. I remember, long before social media, overhearing catty conversations on the sidelines. Social media had just given it a broader reach. I agree that praising the good is worthy – but you equally have to recognize the bad, whether in yourself or others. While many are trying “to do their best”, many are also using the horse as sports equipment, willing to use them up and replace them regularly. That can be seen in all horse pursuits. If we take our responsibility to the horse seriously, we must be willing to call that out … just not with venom. I completely agree regarding the “moment in time” phrase being used to defend some awful things, and as I stated it is not an excuse to do so when blue tongues and rollkur are not moments in time, but systemic issues as you stated. But I have watched far too many people rip others to shreds over a picture on social media that was shared with love and affection only to be told by someone 5000km away that everything they are doing is wrong. What a way to promote the sport and love of our horses. Please do not think I was aiming the comment about vitriol between riders at you or your post, it was more a general thought to add to the conversation and was something we discussed quite a lot at the last Equitation Science conference. The studies that have looked at approaching social change in a contentious matter with a lot of emotion such as equine welfare was found to have better engagement from everyone when using a positive approach as a lot of people are scared to partake at risk of being maligned themselves. Yes we need to recognise the bad training and the bad moments, absolutely. But I think that may be why the photographer felt the need to disclaimer the photographs and make excuses. The repercussions to their business from top riders and/or their fans for making judgments on their riding style could be detrimental to their livelihood. In a perfect world this would not be so, but as we’re all too aware this world is far from perfect. No, I didn’t take it as aimed at me. I try to pass the same message in social media groups all the time … sometimes with positive effect. On the flip side, I have experienced so many people unwilling to see obviously flaw, to serious detriment to the horse, because the rider/trainer is so ‘nice’ that it just ‘isn’t possible’ that they would do anything to harm the horse (even with obvious things like blood or a blue tongue). So, I am equally sensitive to people unwilling to criticize on any level. That is what has put so many horses in such horrid lives. It is always a balancing act – we should all be considerate and reasonable, yet not afraid to speak up when the occasion requires. 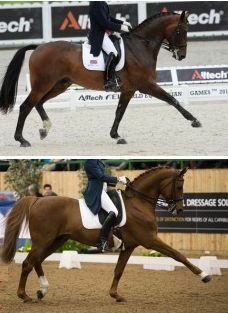 What I would love to see is judge’s scores reflecting what people want to see in Dressage. At the end of the day they are the ones with the true power to change this sport, because the top level competitors who practice incorrectly will have to change in order to continue succeeding. If there are less top level competitors willing to compromise their training practices in the name of success because good training is the key to success then there will be less reason for those who know no better to emulate their idols. Ha, ha … don’t even get me started on that! My mentors were two highly respected judges, Nationally and Internationally … I had as much education in judging as riding. The one who remains is thoroughly disgusted with the state of judge training … and another friend with amazing credentials just gave up her license, after years of fighting the good fight. I see little hope in that area … but anything is possible. It’s very difficult to not become disillusioned with the sport, isn’t it? Yes, it certainly is. I always have some hope … but I cannot say that I see any clear signs of change, yet. But we can enjoy doing it our own way anyway … after all, the horses are the most important part! And they don’t care if we compete or win.